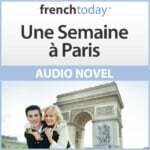 You’re going to Paris but have to keep an eye on your budget? 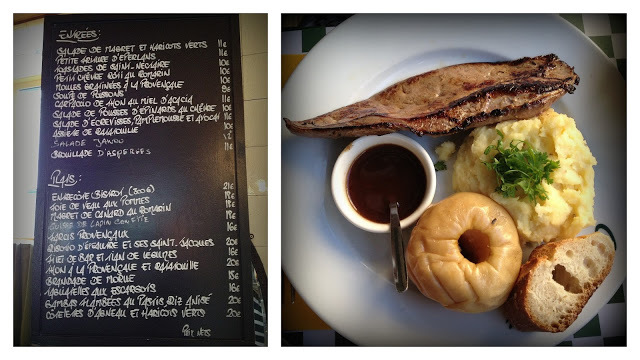 Here are my tips on how to enjoy all of Paris’s culinary delights for a reasonable price. You can eat at some of the best restaurants for a fraction of the cost of their dinner service, not to mention it can be easier to get a reservation at lunch. For example, as I write this, one of the hardest reservations to get in Paris is Spring, whose dinner menu costs 76€ while lunch is 44€. [adblock]The restaurant’s menu will list entrées (starters), plats (main courses) and desserts. or “Entrée + Plat + Dessert = 18€”. You can order individually off the menu (à la carte) or opt for a formule which will save you a few euros. And you don’t have to commit up front to 2 or 3 courses. INSIDER TIP: At lunch, the formule might include only one choice for each course. You save money but sacrifice flexibility. 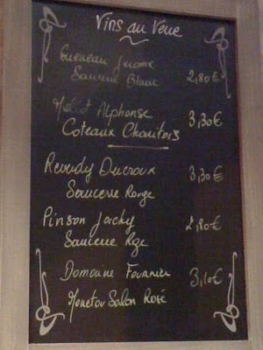 Often on the ardoise (slate/chalkboard) listing the menu, you will notice items that have a number after them, like “+4€”. This indicates a supplement you will pay for that item if you order it as part of a formule. So if your formule is 30€ for three courses and you choose the white asparagus starter which has a +4€ after it, you will pay 34€. INSIDER TIP: I would highly recommend spending the extra 4€ for asperges blanches (white asparagus), cèpes (fresh porcini), fraises des bois (wild strawberries), and many other seasonal or local items. I just don’t want you to be surprised when the bill comes. I once read a good dieting tip: “Don’t drink your calories”. In other words, if you’re counting calories, enjoy food, but stick to calorie-free drinks like water. Along those lines, I’d suggest “Don’t drink your budget” if you want to save money dining in Paris. Order ‘une carafe d’eau’, which is a carafe of high-quality French tap water (but waiters often have to be reminded to bring it). Note that I am not advising you to skip French wine! It is very affordable for great quality! INSIDER TIP: the water in Paris has lots of minerals in it, so your carafe is likely to have white residue on it. It’s not dirty! In the photo, wines are listed by the glass (au verre) and are around 3€ each (full disclosure: this photo was taken in the Loire Valley, so wine is probably a little cheaper than Paris). A Perrier often costs more than a glass of wine! When dining out try to avoid drinks like Coca Cola or Perrier as they often cost more than a glass of wine. Or go for ‘une carafe d’eau’. 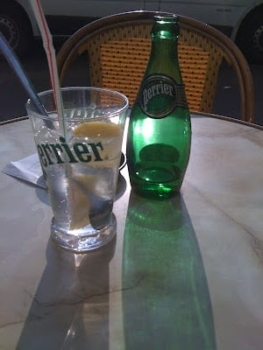 I prefer to order Coke or Perrier when I’m just sitting outside ‘en terrasse’ (as opposed to dining) if I don’t want an alcoholic drink. You can sit at a table for hours and order just one drink the whole time — there is absolutely no pressure to give up your table. INSIDER TIP: While enjoying that table on terrasse, NEVER leave your cell phone sitting on the table, regardless of the neighborhood or the type of phone. The price will be less than if you drank the same cup at a table. Avoid cappuccinos as they’re generally made with shelf-stable, not fresh, milk and are pricey to boot. Get your food to take away rather than to eat at a table in a restaurant. Note that this applies in casual restaurants where you’re ordering food that’s on display for take out too. Not every restaurant offers this option, but many do. The counter person will ask you the question ‘Sur place ou à emporter?’ which means “Are you going to eat it here (sur place) or take it away (emporter)?”. The sur place price will be a bit higher than the take-away price… but mostly you’ll save on drinks. Wine will be much cheaper at home! It’s not the same experience though…. Brunch is popular because it’s Anglo, but it’s quite expensive for what it is. Expect to pay 20-25€ for eggs, toast/pastries with jam, juice, yogurt, and coffee. Enjoy a baguette, French butter and jam for breakfast. A baguette in your local boulangerie will cost no more than just over a euro for their specialty baguette, or ‘tradition’; the lesser quality standard ‘baguette’ will cost even less. 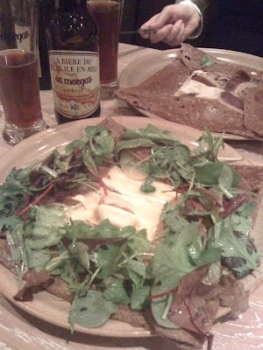 Eat simple, filling foods like crepes. Don’t eat on touristy streets like the Champs-Elysées unless you have a specific recommendation — head off onto side streets. You will notice a French term in restaurant reviews: ‘le rapport qualité/prix’. This literally translates into the relationship of quality to price, or what we would refer to as value for money. 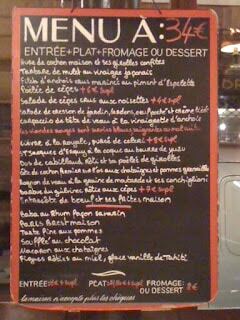 Look for restaurants that people have particularly noted have a ‘bon’ or ‘très bon’ rapport qualité/prix. 10. You don’t necessarily have to tip! In France, a service charge is already included in the price. Waiters are not paid in the same way that they are in the US, where they rely on tips to earn most of their living. French citizens will generally leave no tip, or will give a bit of change if the service is good (or a bit more in nicer restaurants). You will notice that the credit card receipts don’t include a line for tip like they do in the US, so if you do tip – and it’s ALWAYS appreciated – leave it in cash. Do not feel bad paying your bill and not adding something extra — it is completely normal here. I hope these tips have helped you save money on food that you can spend shopping :-) If you have others, don’t hesitate to let me know!